My husband wanted me to place a bulk order for these bags for our business. We are pleased with results and plan on doing business with Custom Earth promos again in the future. Being an eco-friendly company really put your company and these bags over the top. Top notch material and amazing looking stylish bags. Own an environment friendly store and these bags are perfect and sell great! Thank CEP. Brough these reusable durable bags to my most recent trade show and they sold out within minutes. Thanks CEP for helping me promote my business. Loved these bags! They were a huge hit at my company event! Thank you CEP! Own a sporting good store and these sell very good. The colors and image really pop on this bag! Its amazing way to get your name known. Just ordered these bags in bulk for a great price! I love these bags! They really stand out in a crowd, making our logo impossible to miss. I really like how these bags are made completely out of recycled materials. Being eco-friendly is really important to our company so I'm thrilled! The imprint area on this bag is so large, nobody is going to overlook our logo! So excited! The imprint area on this bag is so large, nobody is going to miss our logo. Thank you CEP! Such a practical product. You can use this bag for everything! These bags are so unique! Eye catching and practical! The insulation works great and our logo is highly visible. Thanks CEP! I'm a very satisfied customer. Working with this company was by far the easiest purchasing process I have had in a long time. Such a great promotional product! Visually appealing and durable. The imprint area on this bags is so big! Such a great marketing tool! Order these bags in bulk for a substantial discount. I thought the quality would be lacking considering I got them for such a great price. I am happy to say the quality was great. I customized these earth-friendly cooler bags for all our employees, and those attending our company BBQ. They were a huge success. Really impressed with the quality of these bags. They are so spacious and durable. I would definitely recommend these bags! 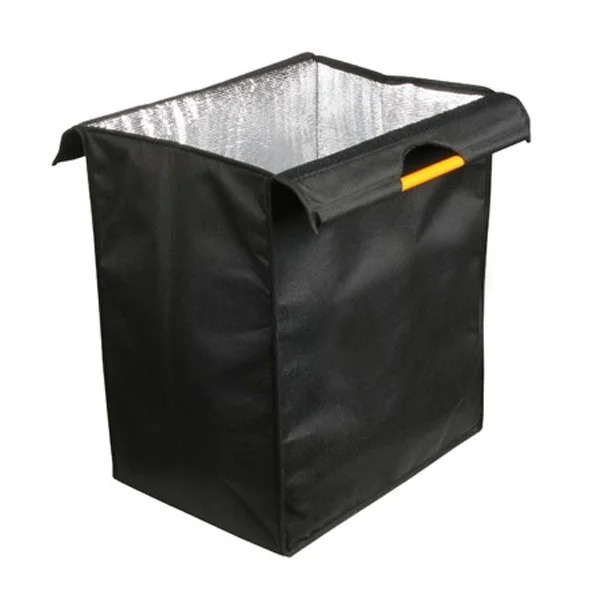 These large insulated bags are a great promotional item. We customized 1000 of them with our brand name and handed them out at the convention. What a great tool to gain useful exposure. The Large Insulated Wholesale Bag from Custom Earth Promos is a completely eco-friendly product. It is manufactured from recycled polyethylene terephthalate (rPET), which is made from recycled plastic water bottles. 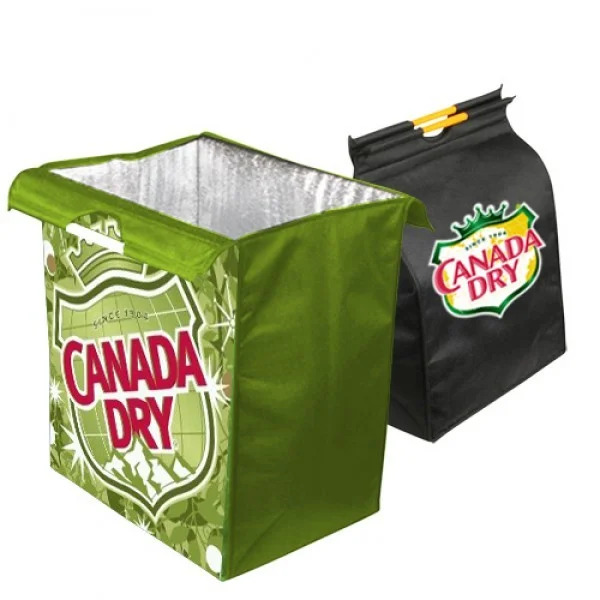 Display your amazing efforts in business promotion with Large Insulated Wholesale Bags from Custom Earth Promos. Your customers will immediately take notice of the huge size of the bag that carries a customized graphic design showcasing your company name and logo. Demonstrate your eco-friendly stance and show customers that you care about them as well as the environment! Give your customers a reason to shop until they drop! Large Insulated Wholesale Bags boast ample space and make excellent promotional tools for your business. These bags serve multiple purposes since they can be used as picnic cooler bags, shopping bags, or even as carry-on bags for journeys. Spice up business promotion strategies by embracing an eco-friendly approach! This bag offers abundant carrying space, providing a large 13" W x 11" H imprint area so that you can have anything you want to market your business. The material is lightweight, foldable, and easy to store. The bag also has a thermal lining to provide insulation for hours at a time. It can be recycled and reused, saving the environment from wasteful, disposable plastic bags. We also provide a Velcro closure for the bag and stick handles to make it easy to carry. We offer a FREE 1 Color Imprint - 1 Location with a choice of 20 colors for printing on the large canvas area of the bag. Custom Earth Promos abides by the California's Proposition 65 for manufacturing products. 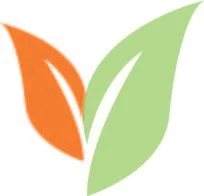 None of our products have any chemical or biological contaminants. Our custom production factory ensures that your orders will be delivered to your doorstep on time; we process all wholesale orders right away, and even attend to rush orders depending on stock availability. The graphic designers at Custom Earth Promos are highly skilled, and work diligently to design every product according to your specifications. Our manufacturing processes ensure high quality and you will find our products strong, resilient, and durable. We offer all services at the lowest prices in the industry. Order Large Insulated Wholesale Bags now and give your promotional efforts a big boost!